On November 17, 2014 at around 9:30AM, I was involved in a bicycle accident at the intersection of 3rd Street and Market Street in San Francisco. I was traveling northbound on Market Street at around 10 miles per hour as I entered the intersection on a solid green light. There was a man standing in the middle of market street, and at the very last moment, he stepped directly in front me. I collided with him handlebars-to-chest, and immediately fell to my right side. Despite over 20 years of bicycling, I went against my instinct and stiffened up and put my hand down to my side. 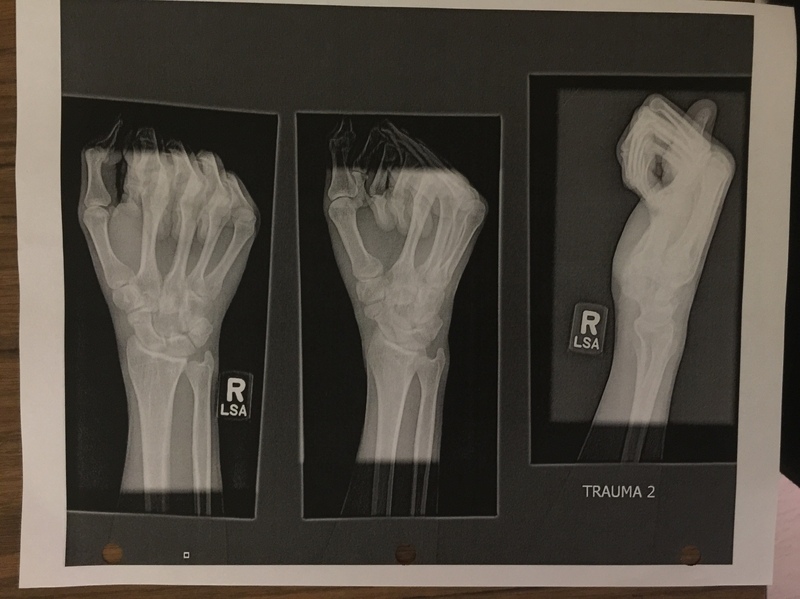 My hand and wrist broke much of my fall, and I put a hairline fracture in the scaphoid bone in my right wrist. Within a second or so, the man who I hit also fell on top of me. My leg was pressed up against the curb on the side of Market Street, and the full weight of the man fell against my femur. The man stood up almost immediately, and mumbled something about "the cars man...", and then began to walk away at high speed. I could now recognize what had happened...a junkie had been walking around in the middle of Market Street, stepped in front of me in a daze, and caused me to crash. As I stood up to chase the man, I first realized something was terribly wrong. My leg felt somewhat numb, and I couldn't move it, much less put weight on it. Like a high school physics problem, I had concocted the perfect storm of leverage -- with my leg against the curb, and the man's weight striking the top edge of my leg, I received a very nasty proximal femur fracture to my right leg. Within seconds passers by stopped to check on me. "Are you ok?" they asked. "Um, no", I replied. "I can't move my leg". Next thing I knew, I was on a stretcher with brace around my neck, cops asking me a million questions. The EMTs attempted to give me a morphine drip, but botched the needle insertion, causing me 3 days of ballooning in my arm. I was then placed on a stretcher, wheeled into an ambulance, headed to San Francisco General Hospital. Broken femur. Hematoma. You done fucked. Why were you biking on Market Street, that's so dangerous. Time for X-Rays. I was then taken to a cold, metal table, and asked to flip over into all sorts of weird positions to get every image possible of my leg. After many X-Rays, I was given the opportunity to make some calls. I called my parents, my girlfriend Karen, and my neighbor/coworker Jake. Jake was extremely stoked to hear that I'd be joining him in his quest to become a titanium monster. My girlfriend Karen arrived, and stayed with me for the rest of the day. The nurses started giving me drugs: morphine, oxycodone, hydromorphone, percocet. Little doses via an IV line, to see how I responded. I became very nauseous as the reality of the situation began to set in, and the narcotics took effect. After a while, I started being introduced to orthopedic surgeons, who explained they will follow me throughout my stay at the ER and potentially the hospital. After assessing the break, they came back and explain that I will need to be admitted to the hospital, and that they will be installing an external fixator to stabilize the break overnight, and provide me with some pain relief. I have a bad break -- not a clean break, but a shard of bone has completely separated from the femur. I'll likely be in the hospital for a couple of days. 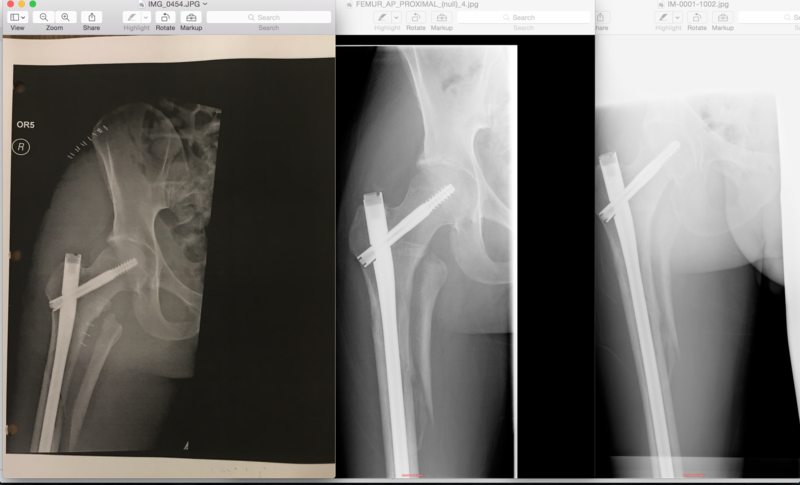 Having the fixator installed involved me being taken to a small operating room, having some anaesthetic injected into my lower leg, and using what appeared to be a craftsman power drill to literally drill a bolt through my leg WHILE I WAS AWAKE. I only barfed a little bit. I was checked on constantly, ensuring that I still had sensation in my limbs, and that my strength was good in the non-injured parts of my body. A few hours later I was admitted into San Francisco General Hospital. My first roommate Danny was amusing. He had many stories to tell about how much he sweats when he and his girlfriend do meth, and had many nutritional questions about microwaving hotdogs. I tried my best to sleep with the fixator in my leg, with a water-weight hanging off of it. You know, it's really hard to sleep in hospitals -- lights are always on, machines are always beeping, there are needles in both of your arms, and nurses come in and out every 30 minutes to check on you or your roommate. The next day I was taken in for my initial surgery. I was informed that they would be using an intramedullary nail to repair the break. 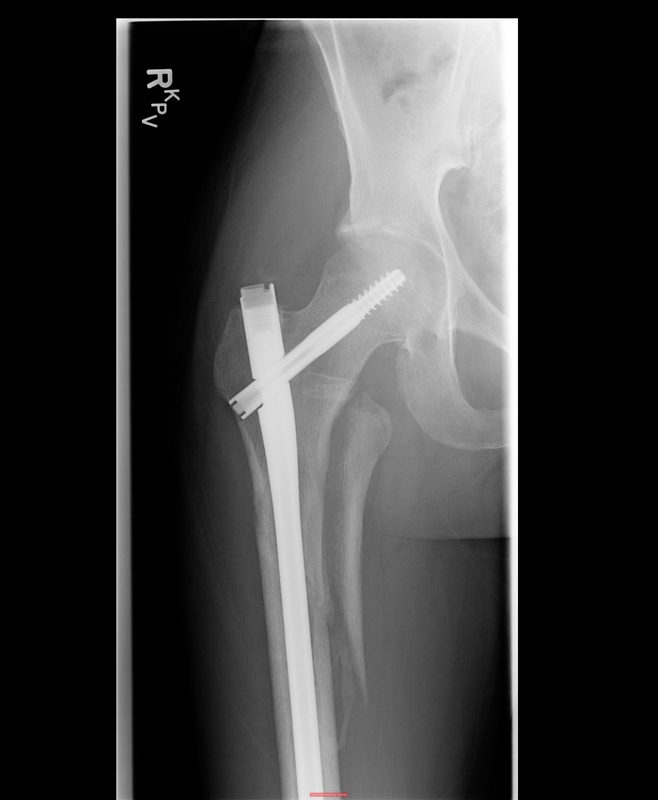 This is essentially a long titanium rod that is drilled into the cavity in the center of the femur, and is fixed in place with a larger bolt into the neck of the femur, and two smaller screws just above the knee. I was told there would be three small cuts made. One on my lower back, one on my inner thigh, and one on the right side of my leg near the knee. Each of these would facilitate installation a piece of hardware. I signed my life away, permitting surgeons to use general anesthesia, and any means necessary to repair my injuries and keep me alive. I remember talking briefly to the anesthesiologists and agreeing to a nerve block. Next thing I knew, I was being escorted back up to my room as they were unable to secure an operating room for me. A few hours later, I was back downstairs at the operating room level of the hospital, ready to go. I don't remember much, other than waking up in the recovery room. As I was coming to from anesthesia, I remember surgeon Jeff MacLean coming to my side, and checking for sensation in my leg. Despite still being only semi-conscious, I clearly remember being unable to feel my right leg from the waist down. The surgeons explained to me that I have developed a somewhat rare complication known as "compartment syndrome", and that I will need emergency surgey immediately now to restore sensation to my leg. What likely happened was, due to the severity and location of the break, the shard of bone had inadvertently pinched the sciatic nerve, rendering my leg numb. I was rushed back into surgery, and a large cut was placed from my knee to my hip to alleviate swelling and unpinch the nerve. Many blood transfusions were needed, and the surgery took several hours. I'm very fortunate to have had such careful surgeons -- if compartment syndrome is not identified and dealt with immediately, often the only solution is to amputate the limb. In order to keep the cut in my leg open, a negative pressure wound vac was installed in my leg, and was wrapped in sterile material. The wound vac is like a big surgical sponge that pumps fluid out from the wound, and increases blood flow. My entire circulation system was damaged in the fall. I spent several days waiting for a followup surgery where the surgeons would attempt to close the cut in my leg. This involved being completely bedridden, and receiving many additional blood transfusions, antibiotic IVs, and tons of painkillers. Not fun. Each day, some sensation was restored in my leg. At the present, I still have minor numbness on the top of my big toe. My mother flew up from Los Angeles to take care of me as well. I've got to say, having family around really gives you an edge in the hospital -- many of the nurses were wonderful, but some were abysmal and seemed to want to do as little work as possible. I can understand this mentality in certain industries, but when peoples' lives are at risk its just shameful. I was lucky to have a wonderful girlfriend and caring mother to prod some of the less-than-motivated hospital staff to do a better job, both with myself and my roommate. On November 21, I was taken for a wound cleaning and flush. The surgeons were unable to close the wound, so I had to continue to wait. They suggested that if the wound could not be closed next time around, the best option would be a skin graft. Thankfully, on November 24, the compartment wound was closed, and sewed shut with around 50 souchers. Physical therapists at San Francisco General Hospital helped me to begin standing again. The first few sessions I spent the entire time just trying to stand. It's incredible how your body gets used to laying down all the time -- when trying to stand, I felt a huge rush of blood to my head, and was unable to maintain consciousness. As a result, I had to ease into standing by simply sitting up a few minutes at a time. After a little while, I was able to sit and eat food, and gradually work my way to standing again. The physical therapists informed me that I would not be discharged from the hospital until I was able to stand and walk on my own (with a walker), as well as maneuver up and down the stairs in the back of the hospital. To make matters worse, my apartment was approximately 50 stairs to traverse, as I live on the fourth floor of the building, and there is no elevator. Finally, on November 29, I was discharged and sent home. I made the treacherous journey up my stairs, and laid in my bed for several days. Recovering was a tedious process. From convincing my insurance that I needed at-home care from a nurse, occupational therapist, and a physical therapist, to simply being able to get from my bedroom to the bathroom was challenging. My physical therapist Joyce Glick was wonderful, and I cannot thank her enough for helping me to be religious about my exercises and regain my range of motion. 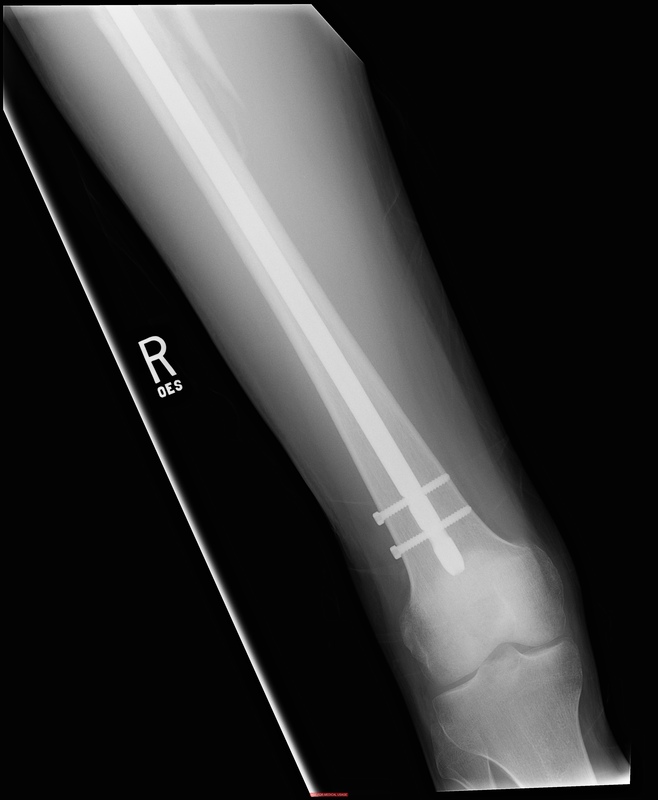 As of February 9, 2015, I was given the OK to begin putting weight on my leg again. Its a long process, but my outlook is good -- the surgeons say I will walk without a limp, and should recover fully. I've learned many things from this ordeal. For one, I have a new apppreciation for walking, and for the sound of ambulance and fire truck sirens in the city. For another, you are reminded who your good friends are -- the ones who go out of their way to come see you at your worst. But most importantly, don't break your femur.